13th Floor Magazine, University of Nebraska Omaha's literary magazine, aims to connect the campus and community through the power of storytelling. We create a biannual eBook and print publication of fiction, poetry, nonfiction, and art, from local and international contributors. 13th Floor believes in the equalizing power of communicating stories from our everyday, and we are committed to sharing a diverse portfolio of talent that makes us accessible around the world. By acting as a vessel between our community and the world, our local writers and artists can set for themselves a place at the table of international art & culture. “Buried Too Soon” by Emily Kern | “A Bus to Memphis” by Ryan Roenfeld | “Lashes” by Madison Bowman. “Forces of Nature” by Amber Emanuel. 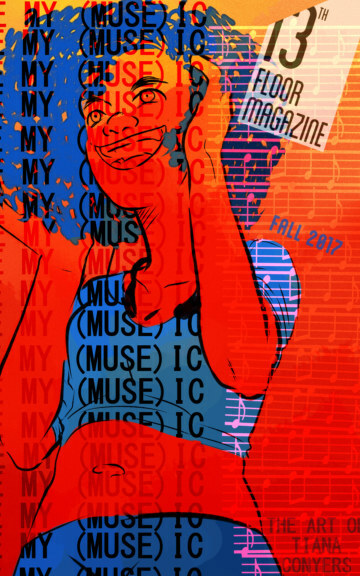 “(MUSE)IC” by Tiana Conyers | "Lizard in Green" by Corbin Schmidt | "Blocked Lights-3" by Guillermo Aldaya. “Woodpecker” by Michael Skau | “Casa C48” by Kriztina Montero-Salgado | “How to Escape” by Henry Irving Nunn. Creative/Copy Editor; Phillip Brown, Creative/Copy Editor; Jamie Fead, Intern, Creative/Copy Editor; Virginia Gallner, Creative/Copy Editor; Whitney Hansen, Creative/Copy Editor; Justin Holman, Creative/Copy Editor; Allyssa Hukill, Creative Editor; Alec McMullen, Creative/Copy Editor; Breany L. Pfeifer, Intern, Creative/Copy Editor.